Double Dragon Neon is an odd combination of things. 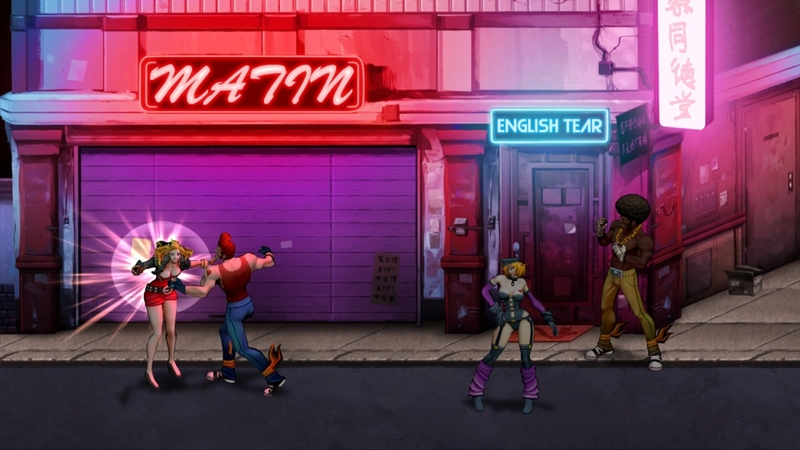 It is as much a love letter to an 80’s childhood as it is a re-imagining of the Double Dragon franchise. Not the least of which is a wild obsession with audio cassettes. More on that a little later. 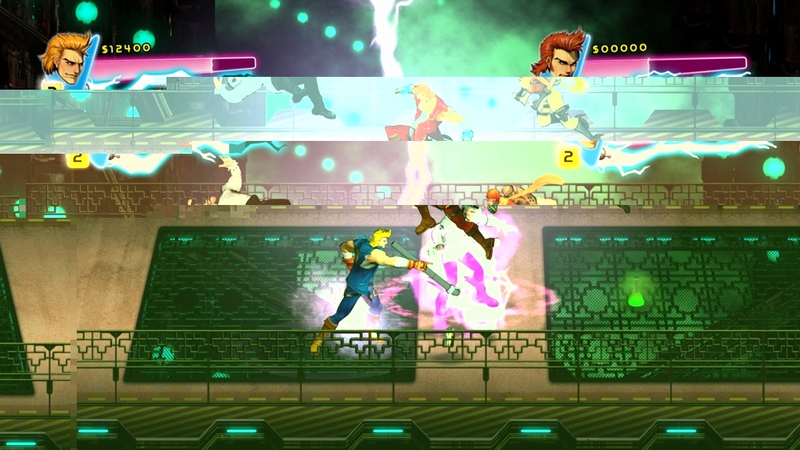 First and foremost, Double Dragon Neon is a 1-2 player side scrolling brawler that is loosely based on the original Double Dragon games. Your girlfriend is kidnapped and you have to punch, kick, stab, or smash everyone in your way to get her back. The action itself is somewhat of a mixed bag. At first, the fighting seems oddly slow and not especially diverse. 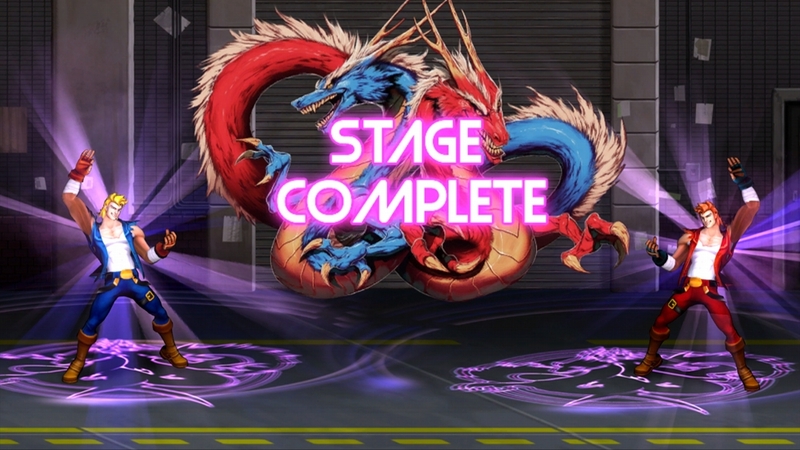 I also didn’t think it felt very much like what I remembered any of the old Double Dragon games to be like. This isn’t necessarily a terrible thing, but when it bears the same name it comes with certain expectations. However, with some time, practice, and a better understanding of how to upgrade yourself it became much more enjoyable. There are 2 things you need to do you upgrade your character stats. The first is to collect audio cassette tapes dropped by enemies or purchased at shops found inside of game levels. Each one has a single song on it that is either 1 of 10 “stance” attributes or 1 of 10 “sosetsitsu” abilities. For example, one “stance” is called “Power Gambit” which upgrades your attack more than defense or HP/MP. Each song is upgraded by the quantity you have, maxed out at 10 each in the beginning. To increase that maximum, you need to obtain “mythril” from bosses to be forged by the “Tapesmith.” Yeah, it’s starting to get weird and it might sound a little daunting. Just break it down to this: collect tapes, equip one of each type at a time, and increase your maximums with mythril. The next most important thing to learn to make the combat easier to manage is how to gleam. When you duck or roll just before an attack you will gleam red for a few moments. During this time you deal twice as much damage. It’s an important way to deal with some of the tougher enemies and especially bosses. Once I got a handle on this the game became a lot more fun. The story is crazy and Wayforward makes no bones about it. The dialog is full of corny humor, but much of it made me laugh the first time I heard it. I hesitate to describe any of it because witnessing the insanity is some of the best content the game has to offer. In the end, my take is that this game is clearly not for everyone. 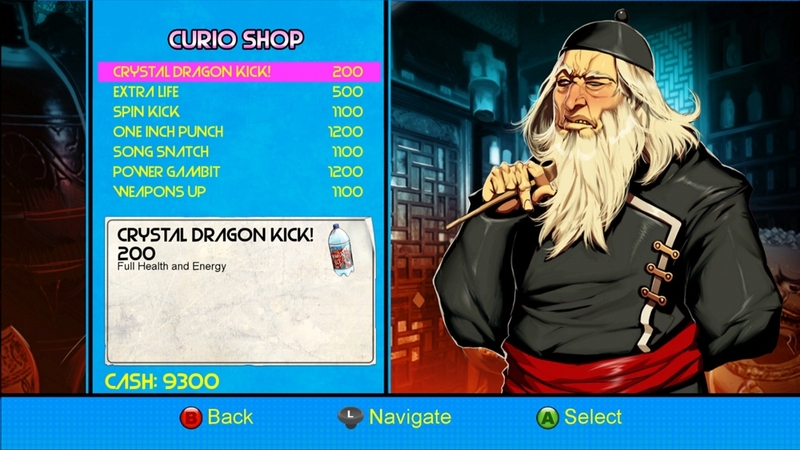 If you’re a diehard Double Dragon enthusiast you’ll probably not like the changes. If you’re a super casual beat-em-up fan, you might never progress through the game because you’ll certainly need to grind a little. If you can’t stand puns, the 80’s, or playing levels over and over again you’re not going to like this game. Having said that, I put 12 hours into the game over the course of 2 days because I found the game to be entertaining, fun, and very addictive once I got the hang of it. -Sweet 80’s style soundtrack including some totally tubular remakes of classic DD tunes. I really liked it eventually but my first impression wasn’t especially positive. If my description sounds intriguing, give it a chance! Review code was provided for XBLA by Wayforward/Reverb Communications; it costs 800($10) MSP. The game is also available on PSN for $9.99 and is currently “free” for PS+ subscribers.